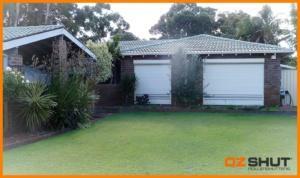 Here are some snaps of house before and after install. Over all I am very happy with the product and the shutters certainly seem to provide the features and benefits I hoped for. The appearance of the house has been enhanced and I now feel confident having windows partly open at night time with the added security of the shutters. I usually leave them up just enough to allow the breeze to come through the gaps between the slats. I will be happy to recommend OzShut to friends and associates when the opportunity arises.